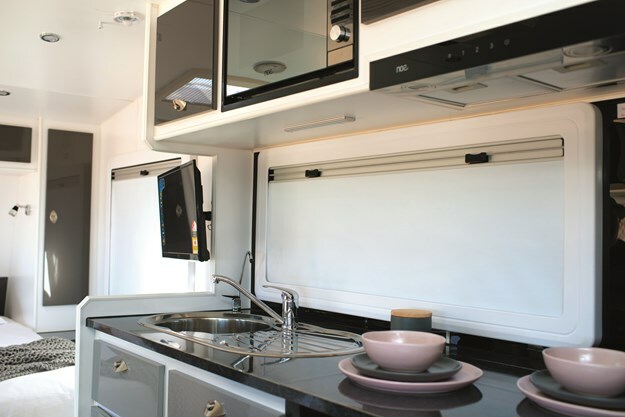 The 6.25m (20ft 6in) Dirt Road Xtreme was unveiled by JB Caravans earlier this year during the Victorian Caravan, Camping & Touring Supershow. 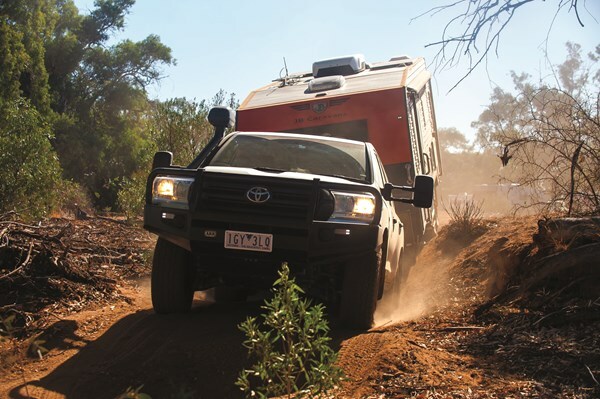 But it was much more at home participating in the 2018 AL-KO ‘Toughest Tow Test’ at Eldee Station, located in the foothills of the Barrier Ranges. 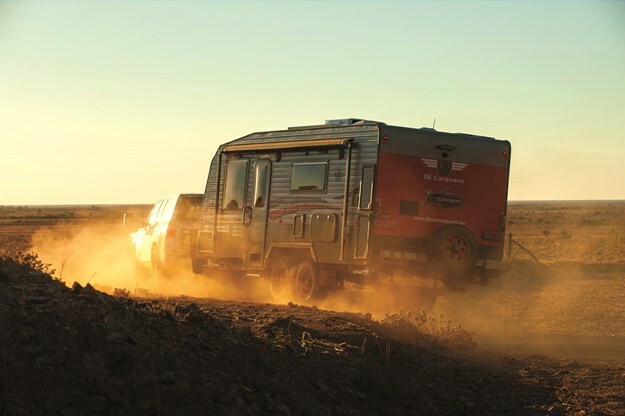 Now this terrain is not for the faint-hearted, but there was nothing timid about the way the Dirt Road Xtreme handled the daunting assignment. This semi-offroad brute cut an imposing figure muscling through the myriad of rocky escarpments. 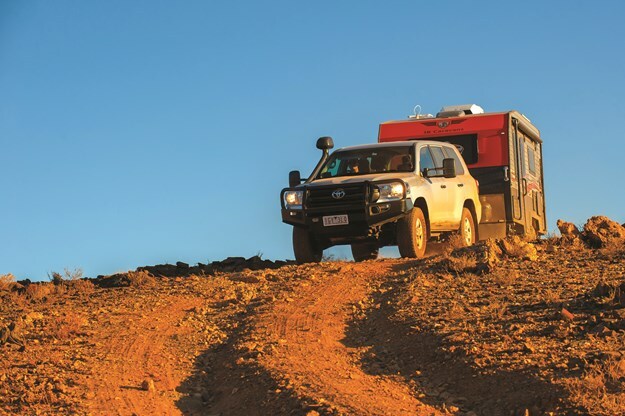 However, the Dirt Road Xtreme is a versatile van that tows smoothly and is designed to take you off-the-grid for extended periods. I was also impressed with its balance and coordination while accessing the torrid landscape. Quite simply, this resolute JB model, with a durable and stylish exterior, is a serious player in harsh and remote environments. The Dirt Road Xtreme (Tare 2600kg; ATM of 3050kg) is beefier than a full offroad stablemate, the Prado-friendly 5.44m (17ft 10in) Gator (Tare 2160kg; ATM 2500kg), I reviewed not so long ago. But that doesn’t mean it’s awkward or clumsy out on the tracks. 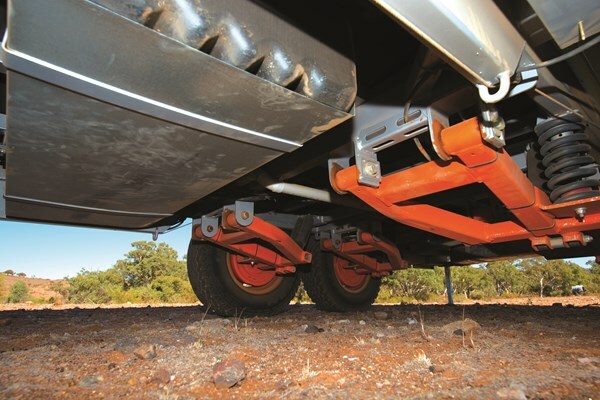 Additionally, you don’t have to a rocket scientist to comprehend its bona fide semi-offroad status, including a 3.2mm-thick zinc galvanised chassis (with 2in raiser), built in-house from Australian tube steel. Plus excellent water (2x95L fresh; 1x95L grey with checkerplate guard) and solar (2x150W roof-mounted panels) capacities. And the Dirt Road Xtreme gains further off-grid credibility courtesy of an extended (200mm) A-frame complete with an AL-KO ‘Click Lock’ Off-Road Pin coupling, AL-KO ESC, toolbox, generator box, stone deflector, 2x9kg gas cylinders and 2x25L jerry can holders. It also rides on AL-KO Enduro Cross Country suspension, 12in electric brakes and anodised 16in wheels, with all-terrain tyres. 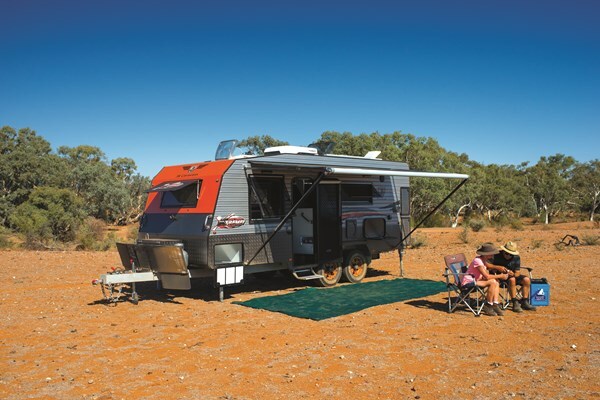 Boasting a high-profile aluminium Stucco armour, the Dirt Road Xtreme comprises a raft of external features including an entertainment hatch, fold-down picnic table, illuminated grab handle, gas bayonet and Dometic awning, plus 2x120Ah AGM batteries, 12V exterior shower (which can be connected to 240V), 28L Swift gas/electric hot water system, generator storage hatch, two water fillers and a mains water inlet with one-way valve. The rear of the van is aesthetically appealing courtesy of a tough-as-nails aluminium composite panel, 900mm black checkerplate, stainless steel grab handles, three-arm rear bumper, spare wheel, reversing camera, LED taillights and a work light. Meanwhile, the Dirt Road Xtreme’s front also has Alucomp cladding, a window protector, 900mm black checkerplate and a work light. Externally, the van is also equipped with a full-length gal-lined tunnel boot with 12V LED light positioned on the offside, 600mm black checkerplate sides, a toilet hatch (cassette has an extendable handle and is also on wheels), external marine grade speakers and adequate LED lighting. And JB employs an acoustic-grade, fire-retardant wool insulation in the roof. The Dirt Road Xtreme has a ‘tough sheathing’, but conversely it’s a ‘soft as butter’ scene inside given its lavish decor. The seductive and roomy front bedroom, with caravan-queen-size bed, is indicative of the generous living space. And there’s loads of storage space courtesy of the overhead lockers, robes and shelved cupboards (and also under-bed), which is a common theme throughout the entire van. There are also decent-sized Dometic Euro-style double-glazed windows, reading lamps and double powerpoints either side. Immediately to the right of the rear entry door is a swish rear full-width ensuite. Obviously the highlights are a 3kg NCE top-loading washing machine, full-height fibreglass shower with opaque door, Dometic ceramic bowl toilet and contemporary square ceramic vanity, with ample bench space and a polished edge mirror. There’s also a recessed sliding door, with a single-barrel lock and cabin hook, for privacy, 12V extraction hatches above the shower and toilet, three lift-up cupboards, two LED downlights, towel rail and towel ring, toilet roll holder, and a window. And below the vanity sits three slide-out drawers, a fold-down compartment to the right, another fold-down compartment similar to that in the kitchen, and two-way LED strip lighting. Immediately to the left of entry is a stylish and relaxing four-seater fabric-upholstered café lounge, with slide-out drawers underneath. I fancied the upholstery-matching recessed flip-out footrests, which have steel bi-fold latches for added support, and the monogrammed adjustable headrests. 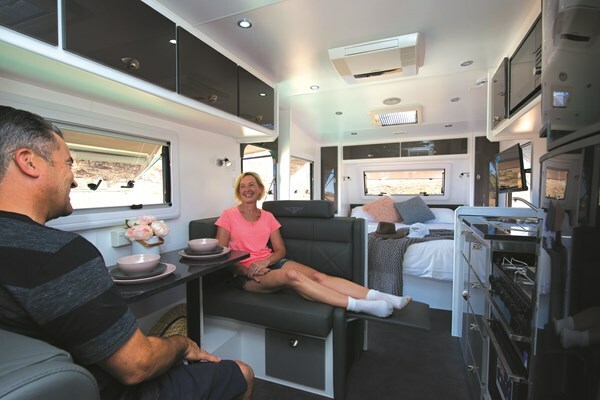 And once again, there is more storage capacity with four overhead lockers, plus a panoramic window, tri-fold table, reading lamps, double powerpoint and 12V outlet, and a magazine holder adorning an outside wall of the rear ensuite. Directly opposite of the lounge is a fashionable and practical kitchen, which actually serves as a culinary connoisseur’s delight. It comprises a recessed Swift 500 Series grill with touch screen rangehood, square stainless sink with flick mixer tap and filtered water tap, double powerpoint, café latte-coloured splashback, and a window that invites scenic sights. 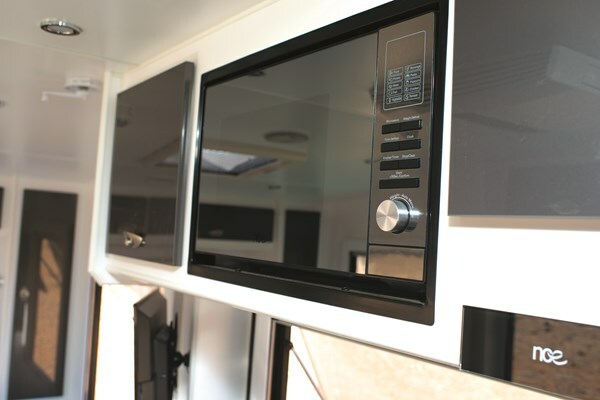 The benchtops are eye-catching, and above them resides a Sansui SADV 1350 multi-entertainment system, 25L NCE microwave and two lift-up cupboards, one housing a gauge display for the three water tanks, Projecta monitor, 240V circuit breakers / 12V circuit breakers (six-switch), 30A ProStar solar regulator, 240V hot water switch, water pump switch and gas hot water switch. The only slight downside was I thought the microwave could have been at a more user-friendly height. Below the Swift four-burner combo is a slide-out cupboard and a storage compartment concealing a gas isolation switch, and below the sink is three slide-out drawers, another storage area, and a waterproof fold-down compartment ideal for holding sponges and dish cloths. There are also numerous LED downlights in the lounge and kitchen zones. Adjacent of the kitchen is an impressive 190L Dometic RMDX25 three-way fridge, which also has a 12V selector switch, plus a lift-up cupboard and a fold-down cupboard concealing a water tank manifold and water pump. Other positive aspects are that all the slide-out drawers are on full extension runners, and the cabinet doors are all piano-hinged. 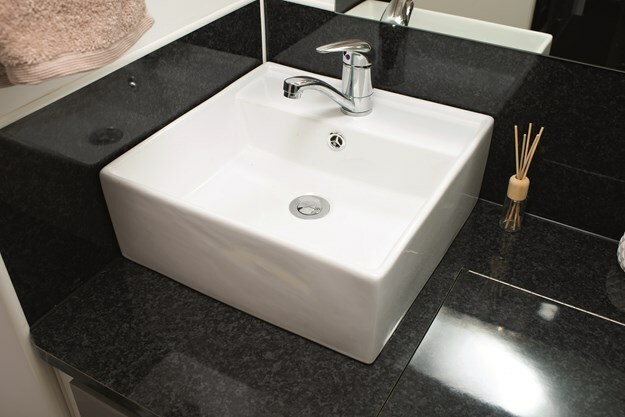 Additionally, the chrome button-less square handles are user-friendly and complement the modern-day internal look. Centrally located, between the lounge and kitchen, is another Heki hatch (increasing natural light and providing good cross-flow ventilation), and directly outside the ensuite is another NCE internal speaker. There is also a roof-mounted Dometic Harrier air-conditioner, a metal grab handle immediately to the right as you step inside, and an illuminated internal courtesy step light. All in all, the Dirt Road Xtreme is designed with adventures in mind far from the madding crowd. But it’s not without some peccadilloes. At $82,990, the Dirt Road Xtreme offers a fair dollop of practicality and ruggedness. 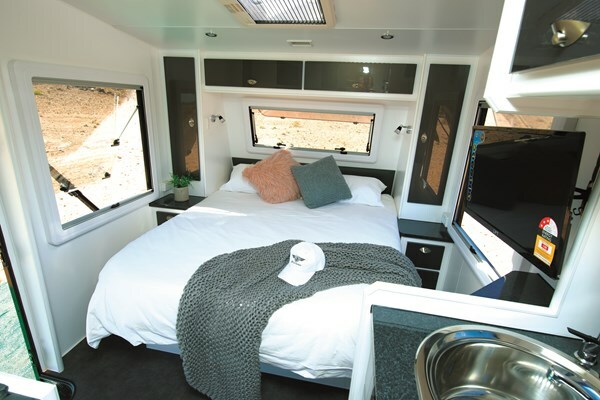 It’s also pitched to the adventurous couple who also appreciate the creature comforts. And it’s an archetypal semi-offroader that’s capable of some ‘Xtreme’ action on dirt roads, if not more challenging scenarios as evidenced at AL-KO TTT.